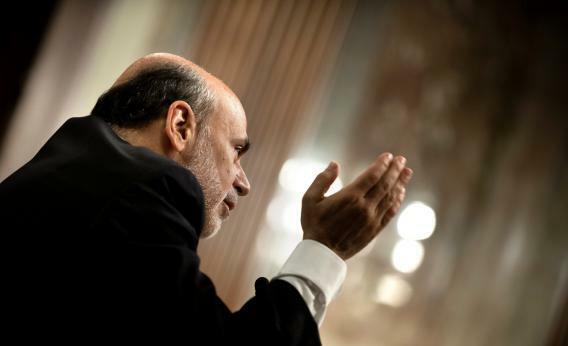 My Question for Ben Bernanke: What if Inflation Were 8.2 Percent? Federal Reserve Chairman Ben S. Bernanke speaks during a hearing of the Joint Economic Committee on Capitol Hill June 7, 2012 in Washington, D.C. The answer, obviously, is tighter money. But that wouldn’t just mean an operational action to raise interest rates. You would, of course, raise interest rates. But expectations matter. If people thought that as soon as unemployment lingered above 2 percent for a month or two that rates would come down again, then inflationary expectations would never be whipped. To implement a tight money policy that worked, Bernanke would need to lecture a little bit. He’d have to say that while of course nobody wants to see unemployment go higher if you want to bring inflation down you have no choice but to tolerate somewhat higher unemployment. He would explain that the inflation isn’t just annoying, but that over the long term it’s quite damaging to the real growth prospects of the economy slowly but surely eroding the bases of American prosperity. Higher unemployment would be a bitter pill to swallow, but all things considered it would be the best choice for the country and the whole purpose of giving central banks operational independence is to let them make those kind of tough calls. What we saw today from the Fed was the reverse of that. The central bank clarified that it is fanatically committed to holding inflation close-to-but-below two percent, and while it’s happy to speak many words about output and employment it basically doesn’t care. Bernanke had various remarks to make about housing policy and mortgage finance and I agree with some of those sentiments. But recall that if we had massively expansionary fiscal policy and cleaned up the mortgage situation and suddenly started adding 400,000-500,000 jobs a month that prices would go up. With 8 percent inflation and 2 percent unemployment, you can’t curb inflation unless you’re willing to tolerate some joblessless. With 2 percent inflation and 8 percent unemployment, you can’t curb joblessness unless you’re willing to tolerate some inflation. If millions of people get jobs, get their own places to live, start commuting, etc., the prices of some stuff will go up. If you want to keep prices low, you have to condemn us to years more of mass unemployment.